Every time I see an interesting recipe I store it under the ‘to try’ section. That section is getting filled pretty fast. So I thought I better start working on them before they pile up and get lost in some part of the computer. Normally, what gets a person to check out the recipe? The most tantalizing is the picture, then if its your favourite ingredient followed by how appealing the recipe appears. 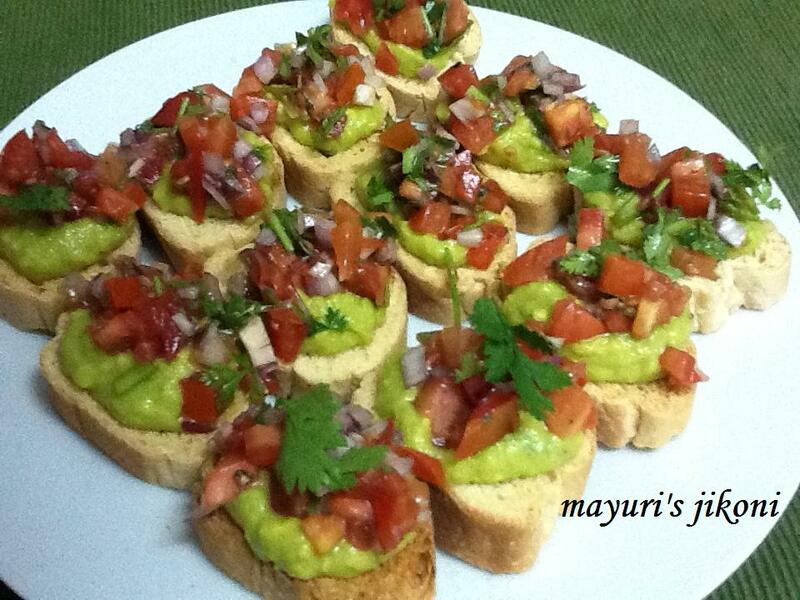 I have made bruschetta very often but what caught my attention was the appealing green and red colours. I came across this recipe when I was browsing on Pinterest. The recipe is by ambitiouskitchen.com. The combination of avocado, tomato, onion and garlic was out of this world. Obviously, I made a few changes to the original recipe to suit my palate and on availability of ingredients.I bought ready tiny crispy bread from Mocha in Nyali. You may toast the slices baguette or ciabatta at home or buy ready toasted slices. Serve these little beauties as a starter or with soup. Peel and mash the avocado with a masher or a fork. You want to leave it a bit chunky and not make it too smooth. Add the rest of the ingredients for the avocado and mix. Keep it in the fridge till required. Rub the toast slices lightly with the garlic cloves. Spread a bit of the mashed avocado on to each slice. Top it with the tomato mixture. Good as a party starter. Leave the avocado and tomato mixture on the side. Guests can help themselves. To prepare the tomato mixture ahead, don’t add the salt otherwise the mixture will become watery. Add before serving. Use fresh basil instead of coriander. If you have any mashed avocado left, use it in place of butter to spread on your toast. Tastes delicious. Use leftover mashed avocado as a dressing for a salad.